Hi! I am Merna, I'm currently in Year 12. 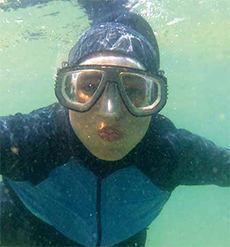 I absolutely love the sea, I'm not a diver but have purchased prescription masks in the past. I very much enjoy learning about different sea creatures through reading and watching documentaries. As a part-time employee at an opticians store, and as a glasses wearer myself, I am particularly interested in the development of prescription diving masks to allow poor-sighted individuals an equal experience to those with good/perfect vision. A kaleidoscope of colours, floating harmoniously in the azure waters, delicately painting a motion picture, more technical and advanced than the digital and virtual world in which we live today. Some can enjoy the delights that this experience offers, whilst others struggle in the grip of a giant pacific octopus, prevented from plunging into the waters free from any restraints.